DSSRTIME will display the capture time from DSSR file names in local time. Make sure the last 6 digits of the file name still show the capture time after processing the video. 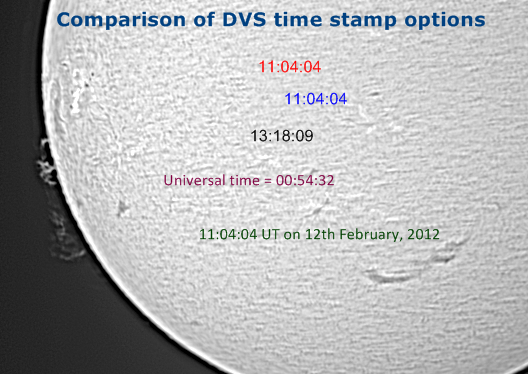 DSSRUT will display capture time from DSSR file names in universal time. CALCTIME from HH:MM:SS to HH:MM:SS will calculate the time to apply to each frame. Any text after the PREFIX or SUFFIX keywords will be added to the time stamp. Big thanks to tester Robert for suggesting this feature.